To communities here, it made sense: After Nepal’s massive 2015 earthquakes, countless roads needed repair, so money going toward fixing them should be stretched as far as possible. But like so many things in this remote district in the foothills of the Himalayas, with its steep terrain and annual monsoon rains, it wasn’t that simple. 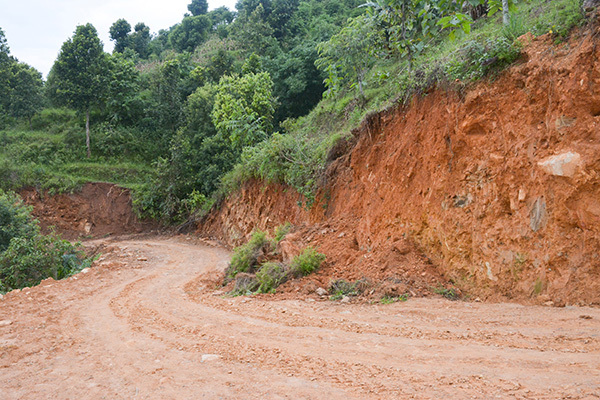 Within months of construction, roads built here with Pact’s support – and without vital erosion-control measures – were already beginning to degrade. The roads were part of USAID’s Sajhedari Bikaas project, which Pact has been implementing in Nepal since 2012 to help rural communities better direct their own, inclusive development, in part by helping them practice with small-scale infrastructure projects. After the earthquakes, Sajhedari Bikaas expanded into five hard-hit districts, using a unique, integrated model that puts Nepalis in charge of their own recovery. Community members decide together on their most pressing small infrastructure need, and then with an up-to $10,000 grant, they implement the project. In addition to drinking water, irrigation and micro-hydro systems, many communities hoped to rebuild devastated roads. Roads in Nepal’s steep mountains tend to erode quickly without preventative measures. Pact quickly changed its approach, encouraging communities to choose non-road projects that could be built to last with the Sajhedari Bikaas grants. But a problem still remained. It’s why Pact jumped at the chance to partner with the U.S. Forest Service, whose International Programs office works in countries around the world, sharing the Forest Service’s knowledge and technical expertise in topics ranging from fire management to ecotourism. After the Forest Service began working in Nepal in 2014 with funding from USAID, it quickly identified better road engineering as a critical need, and added trainings on the subject to its plans, says Nicolai Stöhr, the agency’s in-country coordinator for Nepal. In September, the Forest Service and Sajhedari Bikaas partnered to deliver a five-day training on low-volume roads engineering best practices. It was held in Gorkha, where most of Sajhedari Bikaas’s road repair work took place. Twenty-one local engineers attended, including seven women and a government engineer, and the event was officially opened by the local mayor and deputy mayor. The training cadre consisted of Erica Borum and Mark Weinhold, both water resource engineers with the Forest Service, and Dr. Tara Nidhi Bhattarai, a professor of geology at Tribhuvan University in Kathmandu. A local government official opens the training. Sajhedari Bikaas and the Forest Service deliberately targeted young engineers who will be working in their fields for years to come. The curriculum involved both classroom and field work and covered slope stability and erosion-control methods including drainage, culverts, causeways and bioengineering options – as well as information on the consequences of building roads without such measures. A classroom portion of the training. At the end of the training, participants surveyed the site of a future Sajhedari Bikaas-supported project aimed at protecting two schools that were damaged in the earthquakes and built along roads with no erosion control or slope stability measures. With the help of instructors, participants then created designs, which will soon be used to implement the project. “When you add that field work component so participants can use what they’ve learned in actual practice, you really see the light bulb go on,” Weinhold says. Stöhr says he believes the training will help address what he described as Nepal’s “end of the year problem,” in which roads are built quickly and cheaply without proper engineering at the end of budget years with whatever funding is left in public coffers. “We have to build that awareness that no one wins when roads are built this way,” Stöhr says. Borum, the training’s other Forest Service instructor, agrees. A fieldwork portion of the training. In their formal schooling, the training’s participants say, they were taught only about expensive, hard engineering options for erosion control. The Forest Service workshop gave them more cost-effective, practical solutions that can be applied even by non-engineers. Usha Humagain and Dikshya Dahal take part in field work. Dikshya Dahal, a master’s student in natural resource management and geology, says she also gained significant knowledge in hydrology measures and bioengineering for erosion control. Photos and video by Nicolai Stöhr, U.S. Forest Service, and Jason Katz, Pact.